Markets (all markets) are driven by fear; fear of losing and fear of missing out. Fear leaves behind repetitive patterns in the pricing history of gold. We present several patterns that are in the process of replicating which imply weak gold prices over the next several months. The only constant in the market (any market) is emotion. Specifically, fear; fear of losing and fear of missing out (greed). Repetitive market patterns that are connected in some way to human emotions are the best chance we have of understanding the present and, perhaps, improving our predictions of the future. 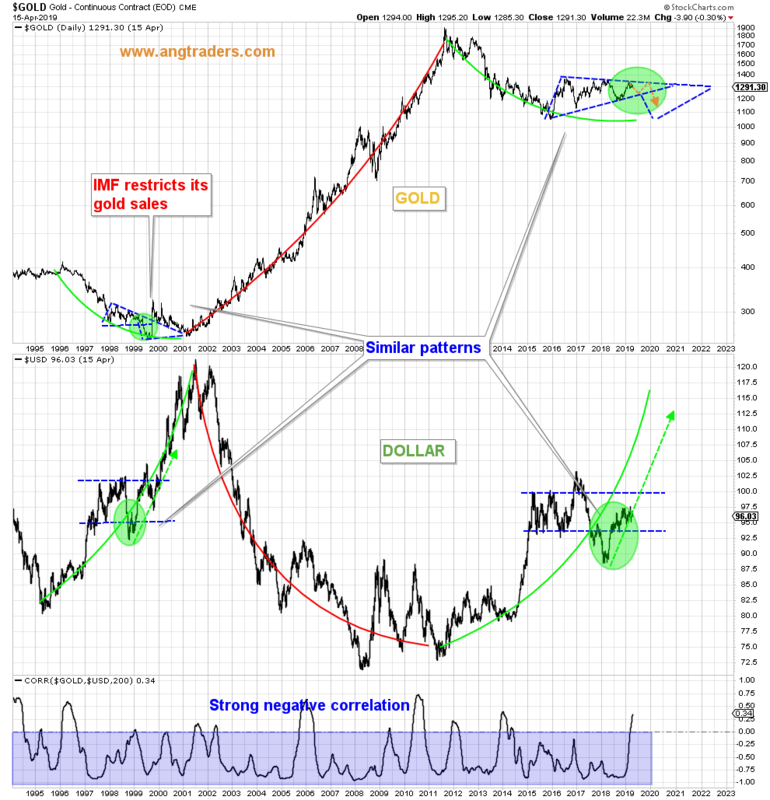 In this piece, we survey the gold market and report on several patterns that we believe are a result of trader sentiment and which are in the process of replicating. Gold has a strong inverse-correlation with the dollar. 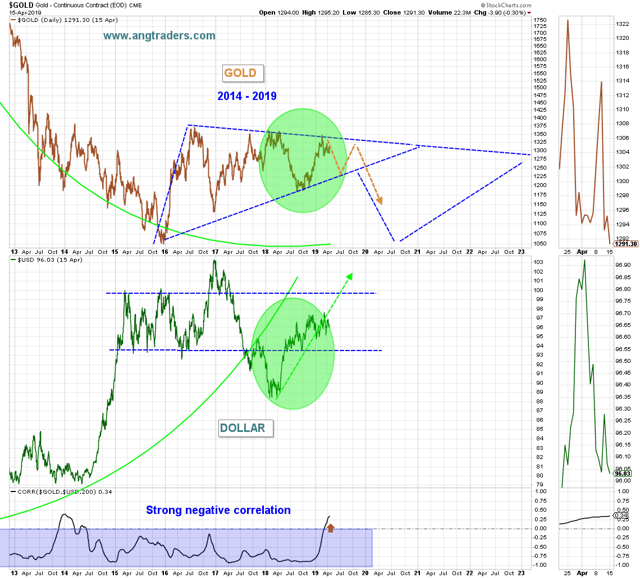 There is a pattern forming that is similar to the trading in 1999-2000; both then and now, the dollar was in a trading range and gold was trading within a pennant formation. In 1999, after gold dropped out of the first pennant formation, the IMF restricted its gold sales which caused the gold price to spike higher before continuing its descent. At this time, as the pattern replicates and gold drops out of the pennant, there is unlikely to be a similar intervention by the IMF. This means that when the price-drop happens, it is likely to be "stickier" than it was in 1999 (chart below). Here is a closer look at 1999-2000. And here is a closeup of recent trading. 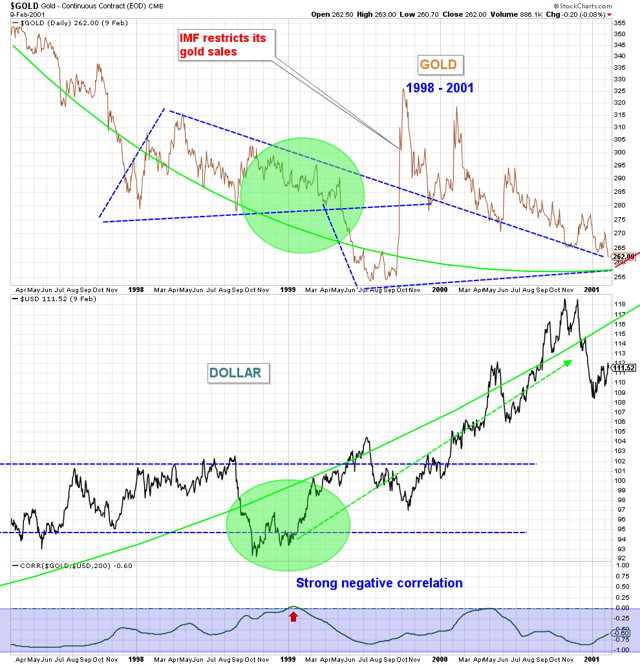 Notice, in the two charts above, that the gold/dollar correlation spikes into a relatively rare positive correlation at a similar point in the pattern just before the gold price drops out of the pennant (red pointers in the charts above). 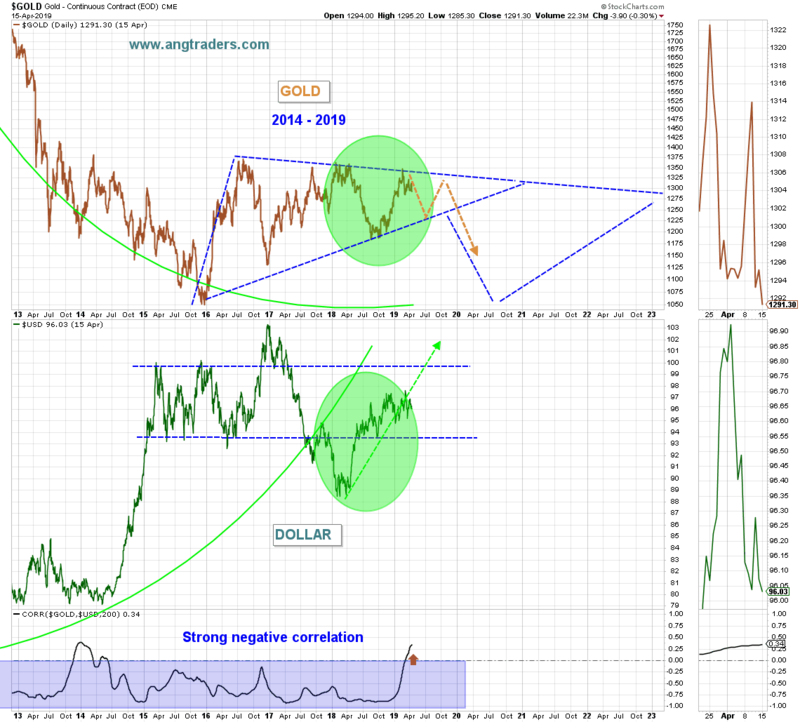 If these correlated patterns continue to replicate, then we expect gold to move lower and the dollar to move higher over the next several months. 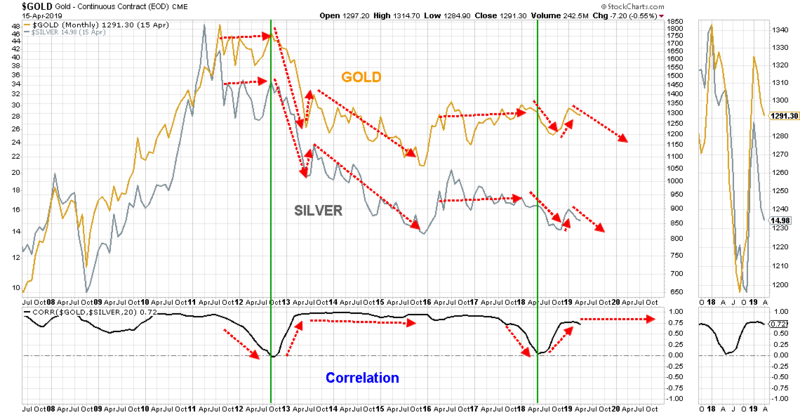 The correlation between gold and silver is normally strongly positive; however, in 2012 and again in 2018, the correlation dropped suddenly before recovering. Both gold and silver seem to be replicating the pricing pattern that formed during the 20012-2016 period (chart below). 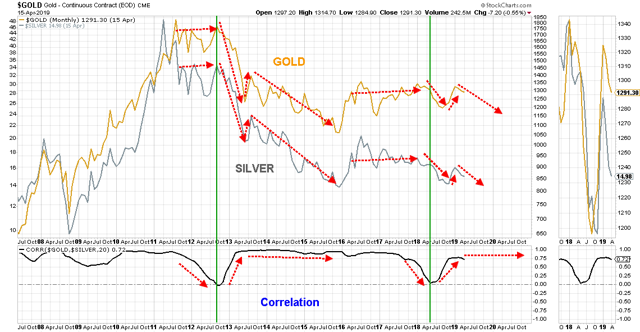 We expect these similar patterns to continue replicating and both gold and silver dropping in price over the next several months. 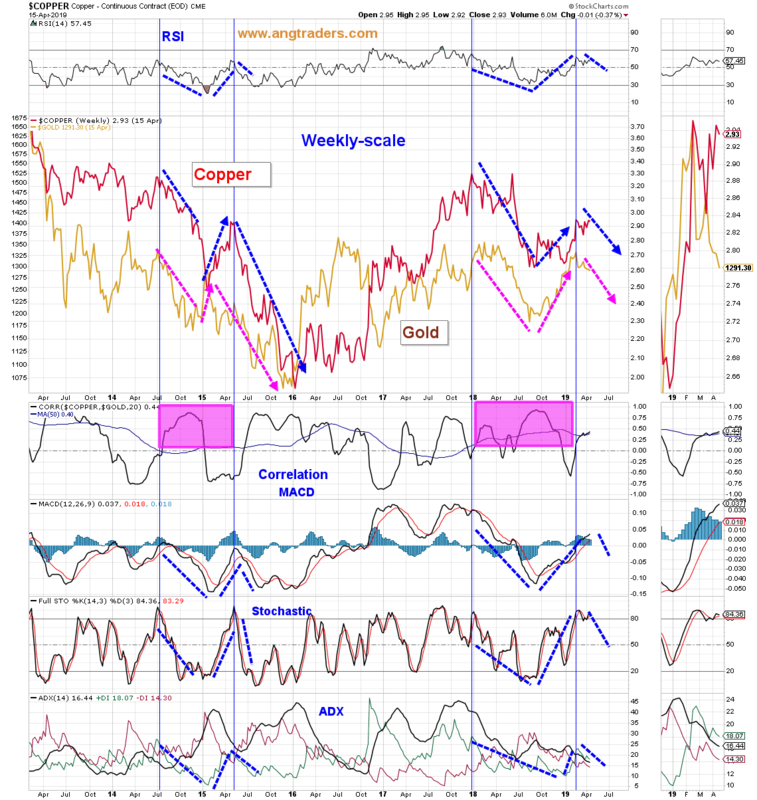 The correlation between gold and copper, while not as strongly positive as with silver, is still positive on average. 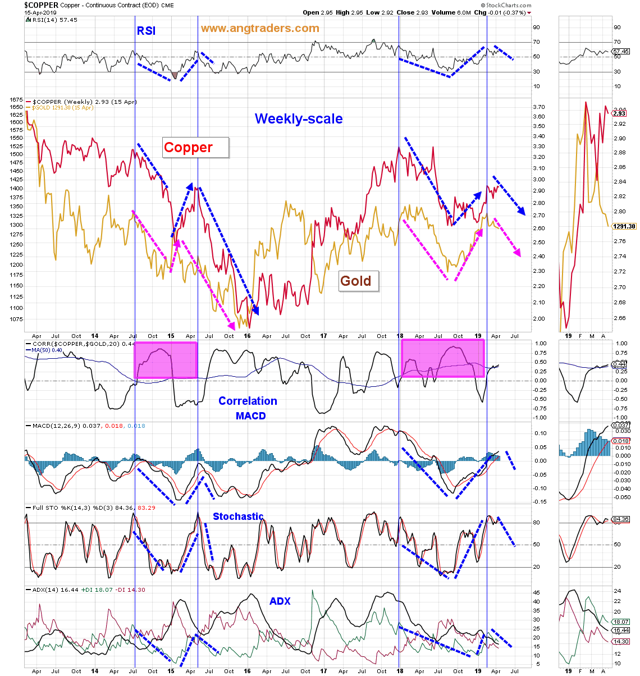 There are also similar patterns developing, in both the price and in the various momentum indicators of copper and gold, as during the 2014-2016 trading period (chart below). If these patterns continue to replicate, like they have been doing since the start of 2018, we expect the price of gold to drop over the next several months. In conclusion, similar patterns in the historical pricing data of the gold market imply that the price of gold should experience considerable weakness over the next several months. During the 2018 Q4 market correction, our analysis showed that we were not at the start of a new bear market and that the bull market, despite being a decade old, was not in the process of ending. As a result, our subscribers did not panic and avoided the losses that come from selling into a correction within an ongoing bull primary-trend. We invite you to take advantage of our 20% discount and a 14-day free trial.